The Johnston County Board of Education Recognized the winners of the Johnston County Elementary Spelling Bee at their February meeting. 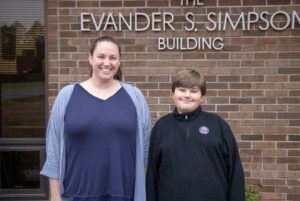 West View Elementary student Carson Philbrick (right) was recognized for winning the Johnston County Elementary Spelling Bee on Jan. 24. Photographed with him is West View Elementary Principal Chenetra Mangum (left). 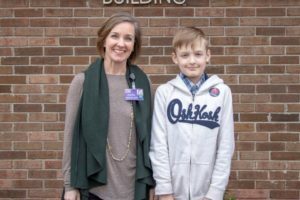 River Dell Elementary student Alex Khonyakin (right) was recognized for being the 2nd place winner of the Johnston County Elementary Spelling Bee. Photographed with him is River Dell Elementary teacher Angela Betterton (left). 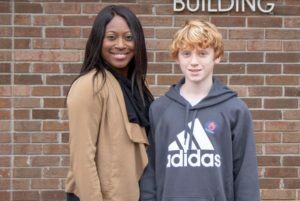 Polenta Elementary student Xander Monserrate (right) was recognized for being the 3rd place winner of the Johnston County Elementary Spelling Bee. Photographed with him is Polenta Elementary teacher Cindy Marotta (left).